It’s that time again. The 14th of February is fast approaching. If you have a sweetheart, wife or husband, you better have a plan in place before the big day arrives. SurePoint IT would like to help by offering a discount on any computer repair now through the end of the month. Keep reading to learn some very interesting facts about Valentine’s Day and its nefarious roots in the Roman fertility festival of Lupercalia and the reign of Emperor Claudius II. Rome was ruled by Claudius the Cruel from September of 268 A.D. until January of 270 A.D. when he died after falling victim to the Plague of Cyprian. Claudius’ rule was short lived with his major achievement being the decisive defeat of the Gothic invaders of the Balkans in 269 A.D. His other claim to fame was the imprisonment and eventual execution of Valentine, a holy Roman priest, who went against the wishes of Claudius II. Under his rule, Rome was involved in numerous bloody and widely unpopular campaigns which made it quite difficult for Claudius to find soldiers for his army. Claudius assumed this was caused by their strong attachment to their wives and families so he banned all marriages and engagements. The Roman Priest Valentine, knowing this was unjust, defied the decree and continued to perform marriages in secret. After discovering the priest’s actions, the Prefect of Rome condemned him to be beaten to death with clubs and then beheaded. This was thought to have happened on February 14th, around the year 270. 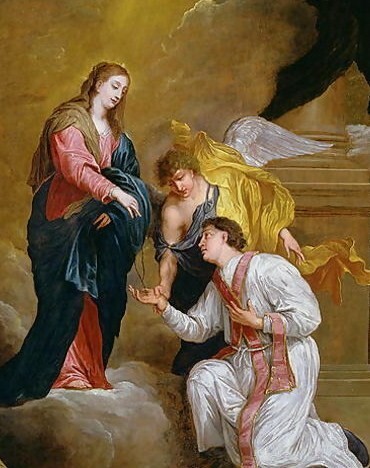 Saint Valentine kneeling in supplication. Receiving the holy rosary from the Virgin. 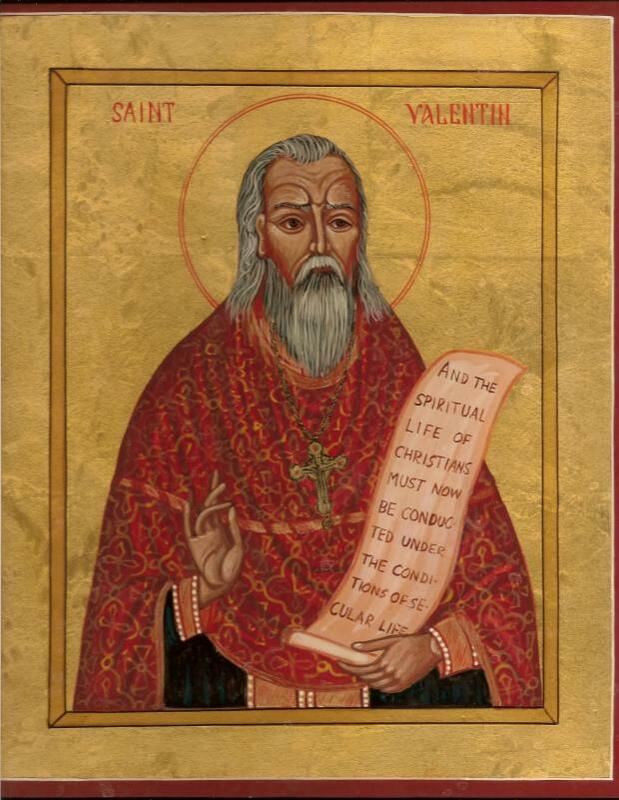 It’s unclear if the Catholic chronicle of another martyr named Valentine of Rome, in the 5th century, was a different version of the original account referring to the same person. Legend has it, that while in jail Valentine cured the blind daughter of his jailer by laying hands on her, thus converting her and her family to Christianity. On the eve of his death, Valentine wrote a letter to his jailer’s daughter. In the note, he urged her to stay close to God and he signed it, “From Your Valentine”. Around this same time, in the 5th century, Pope Gelasius declared February 14th St. Valentine’s Day, combining it with the Pagan Feast of Lupercalia to “Christianize” the fertility festival that started the following day on February 15th. Lupercalia was organized to honor the Roman gods of agriculture, Lupercus and Faunus, along with the founders of Rome, Romulus and Remus. 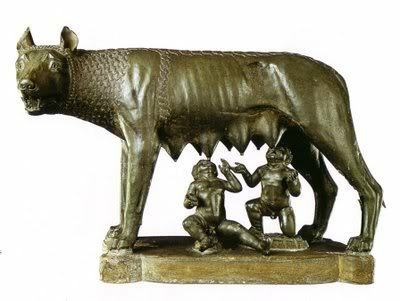 To begin the festival, members of the Luperci order of Roman priests gathered at a scared cave where the infant founders of Rome were believed to have been cared for by a she-wolf or lupa. After sacrificing a goat and dog for fertility and purification, respectively, the goat’s hide was skinned into strips then dipped into the sacrificial blood. They then took to the streets with their blood-soaked strips, gently slapping both women and crop fields with the blood-soaked goat hide. Remarkably, Roman women believed it would make them more fertile in the coming year and welcomed the strange ritual. The feast eventually came to include a tradition involving young men being paired for a year with a young woman whose name they drew out of an urn. This sounds very much like the late medieval and early modern Scottish ceremony of handfasting, which was the normal term used for betrothal. It wasn’t until much later, until after 1400, that written Valentine’s Day cards appeared. The oldest known valentine, still in existence, was written in 1415 by Charles, Duke of Orleans, while imprisoned in the Tower of London following his capture at the Battle of Agincourt. The French poem entitled “Fairwell to Love” was written for his wife, Bonne of Armagnac, daughter of the Constable of France, Count of Armagnac. Letter from Charles, Duke of Orléans to his wife Bonne while imprisoned in the Tower of London. His words reflect the arcane tradition of arranged marriages and child brides that was prevalent during the Middle Ages. In more recent years, arranged marriage was used in the English monarchy with the union of the late Princess Diana and Prince Charles. Unfortunately, Bonne died whilst Charles was still in captivity leaving the couple childless. Surprisingly, Bonne was his second wife and only 11 years old when she married the 16-year-old Duke. Prior to his marriage to Bonne, at the age of 12, he married Isabella of Valois. Isabella was not only his 17-year-old cousin and daughter of Charles VI, King of France, but also the widow of King Richard II of England. Sadly, Isabella died whilst giving birth to her first child, Joan of Valois. Coincidentally, a few years later, Henry V of England commissioned author John Lydgate to compose a valentine note for his future wife, Catherine of Valois, the younger sister of the late Isabella of Valois. 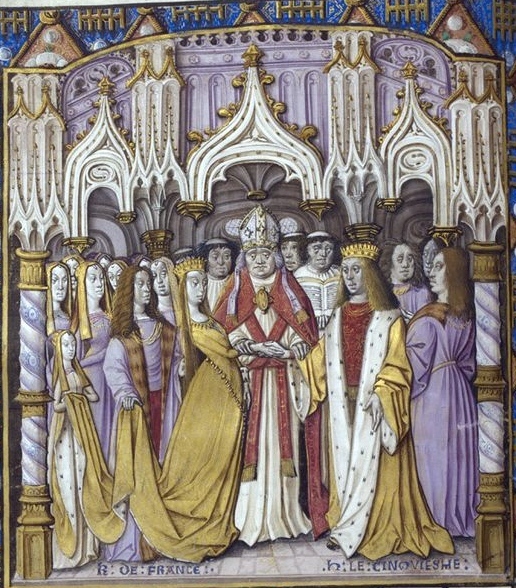 Miniature of the marriage of Henry V and Catherine de Valois. Valentine’s Day is celebrated in Canada, Mexico, France, Australia and the UK. Great Britain saw Valentine’s Day begin to be popular around the 17th century and by the middle of the 18th century exchanging small gifts or handwritten notes was the norm. Surprisingly, in 1653, the English puritanical leader Oliver Cromwell banned St. Valentine’s Day customs when he became Lord Protector of the Realm. The Stuart King Charles II reinstated Valentine’s Day once he was restored to the English throne in 1660. By the beginning of the 20th century written letters were being replaced by printed cards thanks to the improvements in printing. Americans were exchanging handmade valentines in the early 18th century with mass-produced valentines being first introduced around the middle of the 19th century. The tradition continues with an estimated 1 billion Valentine’s Day cards sent each year. ♥ Groundhog Day was originally observed on February 14. ♥ It’s estimated that 19.7 billion dollars was spent by Americans on Valentine’s Day in 2016. Which is up from the 18.9 billion in 2015 and 6 billion more than 10 years ago when Americans spent 13.7 billion. ♥ 4.5 billion dollars was spent on jewelry during Valentine’s Day 2016 and over 1 billion was spent on greeting cards. ♥ Valentine candy conversation hearts have a shelf life of five years. 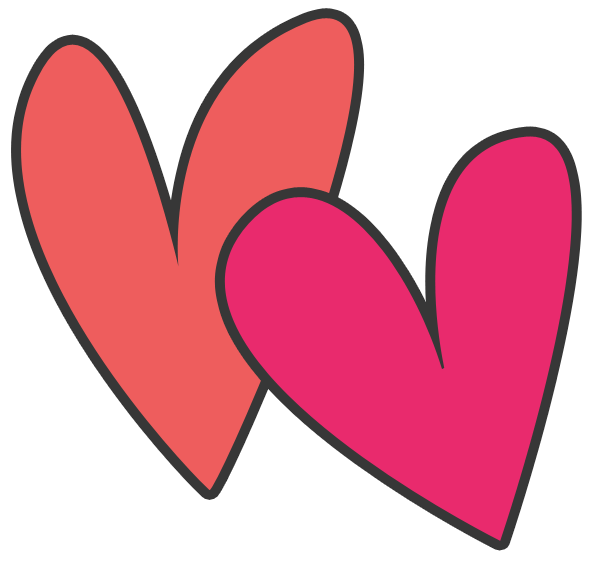 ♥ Over 300,000 letters go through Loveland, Colorado each year to get a special heart shaped stamp cancellation for Valentine’s Day. ♥ In 1969, St. Valentine’s Day was removed from the Roman Calendar of Saints by Pope Paul VI, though its religious observance is still allowed. ♥ Madame Royale, daughter of Henry IV of France named her palace “The Valentine” because she loved Valentine’s Day so much. As you can tell, Valentine’s Day has seen its share of changes over the past 2 decades. While slapping your woman with bloody goat skin may not be your wisest choice this Valentine’s Day, repairing your love’s computer will. 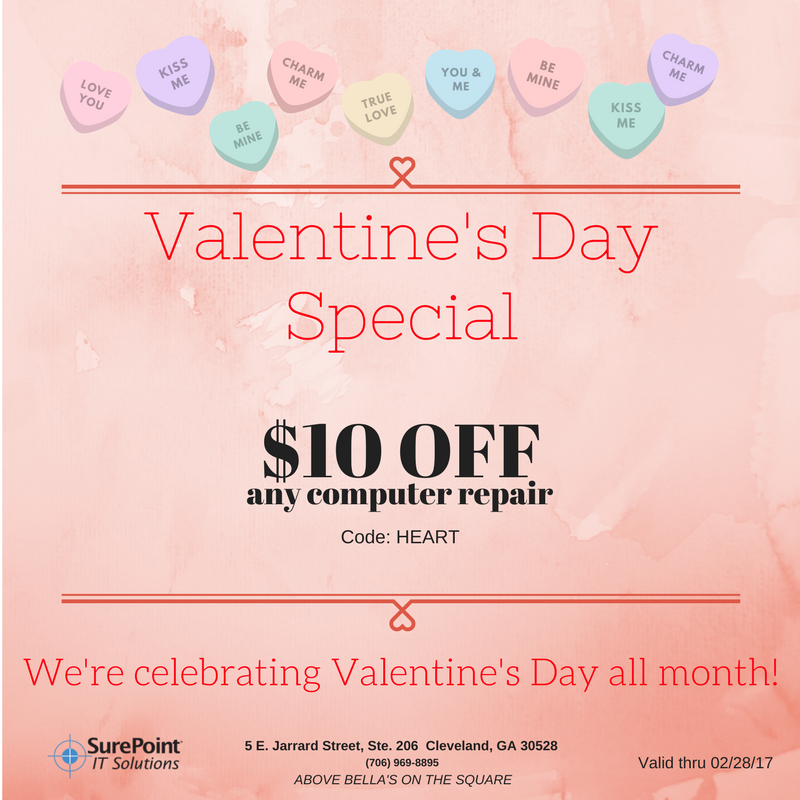 Give the technicians at SurePoint IT a call at (706) 969-8895 and mention the Valentine’s Day code above or bring us the coupon to receive your $10 discount. We look forward to helping make this Valentine’s Day memorable, in a good way, and maybe leaving out the five-year-old candy heart’s is a good idea too!